Rave Flyers - Art or advert? Rave Books have you read any of these? I have yet to located copies of all the books yet as a number of them are out of print. I can however personally recommend: Altered States, King of Clubs and Energy Flash as great reads. I had one. Did you? Flyer walls were widespread and a much loved thing with hundreds of thousands all over the country from aspiring pre teenages, teenagers and older. Each week you would go to you local record shop and collect the new flyers. Some times they were rashioned to stop you taking loads and after reading them for the latest new attraction, 100k rigs etc and new DJ name which would evoke images of drug taking and happy people (Ellis Dee - Vibe etc) you would carefully add the flyer to your flyer wall. 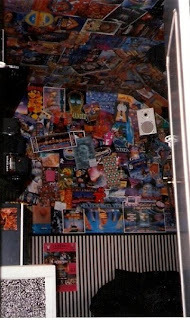 This flyer wall would grow like some colourful mould taking over first one wall then another and if you were really dedicated eventually the ceiling. The one showing is of Wesley Cole Alcorn's. If you have a flyer wall picture do email it to us: fantaziamusic@gmail.com as we would love to use it. Is this the most Glowing flyer ever? We have just released the flyer for our next big event Fantazia The Ultimate UV Glow Show. And what a stunner this flyer is. Once again featuring the gorgeous Fantazia girls but this time with what must be the most glowing flyer effect of all time, surely....?